Yesterday, we sold our entire collection of live animals! We did this because our food costs have become exorbitant. So we sold them all to a friend of ours, Rabbi David Bar-Cohn. The total value of the collection is around forty thousand shekels; he made a down payment of ten shekels, and will pay the balance if and when he ever decides to remove them from the museum premises. In the meanwhile, the animals are still at the museum, but with a very significant difference: they are now the property of someone who is, as his name suggests, a Kohen (priest). Now, a kohen is the recipient of Terumah and Maaser (tithes). However, today, when there is no Temple, Kohanim are assumed to be in a state of impurity, and may not eat Terumah and Maaser. But their animals can! So we will now be receiving Terumah and Maaser from various sources, at no charge, to feed to Rabbi Bar-Cohn's animals. Problem solved! 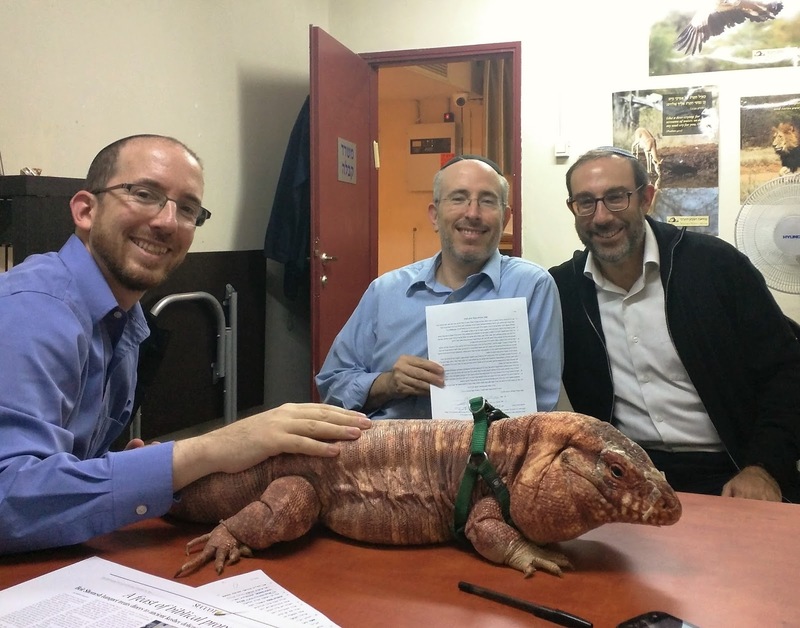 Pictured below, from left: Rabbi Dr. Natan Slifkin, Rabbi David Bar-Cohn, and Rav Menachem Copperman, along with one of Rabbi Bar-Cohn's new acquisitions. Clever! If you ever need another buyer, I (Daniel Avraham ha-Kohen) would be happy to help you out. An absolutely brilliant example of thinking outside the box to solve a real world problem. "Now, a kohen is the recipient of Terumah and Maaser (tithes). However, today, when there is no Temple, Kohanim are assumed to be in a state of impurity, and may not eat Terumah and Maaser"
Whole lot of editing needed here. A kohen is not a recipient of Maaser; the fact that a kohen cannot nowadays eat terumah is only tangentially related to the absence of temple; a Kohen, or anyone else, may eat Maaser. Everyone knows that, obviously, but the sentences as written are literally false and hence require editing. Where do you expect to get the Terumah and Maaser? I'm boggled. 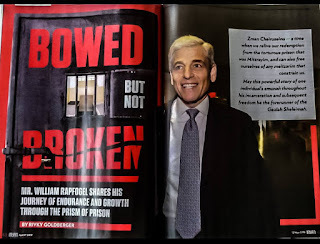 All for it, but let's keep in mind that halachic artifices like that (and selling chametz, and selling firstborn animals, and prozbul, and hetter iska, etc etc etc) leads directly to daily minyanim in the prison system. Just a practical question here, but don't you need more than just a down payment to make it belong to the Cohen? The Mishna is Kiddushin 26a says that one cannot acquire movables with money, you need another manner of קנין. Mestama, they took care of this by having the Cohen acquire a small part of the museum real estate, or by doing hagbaah with the reptile (or whatever it is) on the desk in the picture (Vezos HaIguana?) and having the kinyan apply to all the other animals as well. You'll need to find other food for Shabbos and Yom Tov, won't you? 2. I guess our host doesn't have any carnivores? you should have asked about shviit. Hmmmmm. You have remarked earlier that you don't like mechiras chometz. Why do you consider this different? Ha! I knew one of the lefties would pipe in shouting, "Loophole!" I would break up mechirat chametz into two categories, enterprise and personal. If you are a brewer you could easily have 10 tons of malt on hand at a given time, and getting rid of that would be financially ruinous. Similarly, if you have a liquor store, you could have tens of thousands of dollars of inventory that you can't own. These are the people that mechirat chametz was intended for. Over time personal mechirat chametz has become popular. Personal mechirat chametz is arguably against the original intent of the heter, and is definitely against the spirit of baal yeraeh baal yematzeh. The opponents of mechirat chametz are generally fine with the brewer or liquor store owner selling his stock, but are less than thrilled when you sell your personal chametz to get around issurei deoraita. You can be against something in principle, yet still do it all the while it is legal. There are many people who will tell you privately they don't think the government should have so many welfare type programs, but hey, if its available, they're going to take advantage of it. There are people who will tell you they can't stand ambulance chaser lawyers who bring cases they know perfectly well to be bogus just to try for a settlement; but as long as its legal, they'll give it a shot too. You have to differentiate between Maasar Rishon and Maasar Sheni. א,ה [ד] ועזרא קנס את הלויים בזמנו, שלא ייתנו להן מעשר ראשון אלא יינתן לכוהנים--לפי שלא עלו עימו לירושלים. But Maasar Sheni is kept by the owner. ג,א האוכל מעשר שני בטומאה לוקה, שנאמר "ולא ביערתי ממנו בטמא" (דברים כו,יד)--בין שהמעשר טמא והאוכל טהור, בין שהמעשר טהור והאוכל טמא: והוא שיאכל אותו בירושלים, קודם שייפדה--שאינו לוקה על אכילתו בטומאה, אלא במקום אכילתו. אבל אם אכלו בטומאה חוץ לירושלים, מכין אותו מכת מרדות. [ב] ואפילו להדליק בו את הנר אחר שנטמא--אסור עד שייפדה, שנאמר "ולא ביערתי ממנו בטמא". א,ב מעשר ראשון מותר באכילה לישראל, ומותר לאוכלו בטומאה--שאין בו קדושה כלל; וכל מקום שנאמר במעשר קודש או פדייה, אינו אלא מעשר שני. א,ג ומניין שמעשר ראשון חולין: שנאמר "ונחשב לכם, תרומתכם--כדגן, מן הגורן, וכמלאה, מן היקב" (במדבר יח,כז)--מה גורן ויקב חולין לכל דבר, אף מעשר ראשון שניטלה תרומתו חולין לכל דבר. What changed by selling the animals to a Kohen? Do farmers give more than one kernel of wheat for a year’s crop? That wouldn’t add up to too much. Is it cheaper than chullin? Humans can eat it b’tumah so why give it to the animals? It doesn’t go to the Kohen. Whoever owns the animals should be able to get it for cheap. No need to sell the animals to a Kohen. Whilst I love the idea, it would surprise e if this is a new one. Dont other zoos in the holy land do the same?? More to the point, does the kohen who owns these animals have the personal obligation to check that they are fed before he sits down to a meal? or may he rely on te museum's staff?